It would be foolish of Australia to jeopardise their 1-0 lead over India in the present four-Test series in quest of equalling the record of 16 consecutive Test victories established under Steve Waugh. Sachin Tendulkar, who was in the middle when the alleged racial spat between Harbhajan Singh and Andrew Symonds broke out, is likely to testify in favour of the Indian off-spinner during the hearing scheduled with the ICC Match Referee here tomorrow. Taking a serious note of the race row involving Harbhajan Singh and Andrew Symonds, the ICC today roped in reputed British lawyer Nigel Peters to advice match referee Mike Procter during the disciplinary hearing against the Indian off-spinner here tomorrow. What a fascinating day of cricket it was. Test match cricket was at its traditional best on Saturday at the Sydney Cricket Ground as the crowd witnessed an absorbing contest between the bat and the ball. Graeme Smith smashed 85 to guide South Africa to a seven-wicket win over West Indies on the fourth day of the second Test today. Delhi were reeling at 49 for three in the first innings after bowling out Baroda for 199 on the first day of the five-day Ranji Trophy Elite group semifinal here today. Russian number two Mikhail Youzhny powered into the ATP Chennai Open final with an authoritative 6-2, 6-3 win over Croatian teenager Marin Cilic today. In the other semifinal, French Open champion Rafael Nadal of Spain beat compatriot and twice former winner Carlos Moya 6-7, 7-6, 7-6. Local favourites Chandigarh Dynamos edged out Hyderabad Sultans 4-2 in a penalty shootout here today to set up the title clash with Bangalore Hi-Fliers in the fourth edition of the Premier Hockey League. a gold-coloured jutti. 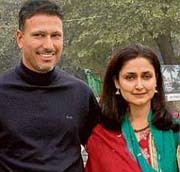 Accompanying the petite Kudrat was her celebrity husband Jeev Milkha Singh in his typical formal sports wear. They made a fine couple as they walked down the pathway to the waiting mediapersons who had gathered at the Chandigarh Golf Range this afternoon to meet the newly-weds after their “secret” wedding in the district courts yesterday. With the Australians 282 for four in their 2nd innings - thanks to a skillful 29th Test hundred from Mathew Hayden - or 213 ahead, the Indians are unlikely to be set a target of less than five runs an over, irrespective of the hosts being bowled out or declaring. This may be hard to overhaul on a worn out though perhaps not treacherous 5th day wicket. Despite the spinners, Anil Kumble and Harbhajan Singh beating the bat as well as inducing edges which either fell short or wide of fielders, the tourists failed to convert the advantage of having the hosts two down for 90 - only 21 runs in surplus. The home side escaped, not without intervention from umpire Mark Benson, who gave Mike Hussey - struck on the shin on the back-foot - the benefit of the doubt. This, Mr Consistent of Australian cricket was then 22. At close, he was 87 not out. Conditions were quite conducive to aerial movement, though the bowlers failed to swing ball, only five overs old, much. R P Singh, the more likely to wobble it, was arguably employed from the wrong end. But both he and young Ishant Sharma operated with discipline; and after 15 overs, Australia were going at only two runs per over until the first of several rain breaks occurred, eventually truncating play by 12 overs. Indeed, at one stage, Kumble packed the off-side with eight fielders, which meant RP could ill-afford to deviate from an off stump line. To his credit, he didn’t. But it was the introduction of spin that really secured the breaks for India. First, Phil Jaques top-edged a sweep to square; and then, Ricky Ponting perished to the first ball he faced from Harbhajan Singh - the fifth time he’s done so to this off-spinner out of eight dismissals to him in 12 innings. Closing the face of his bat, he front edged to silly point. “Bhajji” continued to tease and torment, but his average bowling speed of 88 kph suggested he was pushing it through a little too anxiously. The methodical Mike Hussey, who averages over 80 since a belated entry into the international scene, joined the great barrier reef of Australia, Hayden. The Indians felt they had the former caught down the leg-side off a reverse swinging delivery from RP, but this was not confirmed by the snickometer. As for his partner, there was no fortune factor attached to his progress. Having seen off the awkward phase, Hayden accelerated. With sweeps, pulls and off-drives and one reverse sweep at the expense of Harbhajan, he bludgeoned a dozen boundaries in his second century (123) in as many Tests in this series, regardless of a troublesome right thigh, which called for a runner. India went on the defensive and challenged the batsman to take greater risks. He duly did, reverse sweeping into the hands of point. The very next ball, Michael Clarke was quite patently caught at slip. Amazingly, he waited to be given out, taking a chance, such has been the level of umpiring in this match. Kumble, then, narrowly missed a hat-trick, as Andrew Symonds was struck slightly too high up on the pads to be declared lbw. So, Australia steadied the wobble at 250 for four, with Hussey continuing in a meticulous fashion, with quick footwork, which enables him to as gloriously caress the ball through the covers - as Kumble realised - as pull to midwicket, though Yuvraj Singh dropped a difficult chance here off the Indian skipper. The Western Australian completed his 9th half-century and also breezed past the 2,000 run mark in a mere 20 Tests. Bowling: RP Singh 14-2-47-0; Ishant Sharma 8-1-37-0; Harbhajan Singh 28-5-65-1; Anil Kumble 29-3-110-3, Sachin Tendulkar 2-0-6-0; Yuvraj Singh 2-0-11-0. Indians will be well-represented with skipper Anil Kumble, manager Chetan Chauhan and media manager M V Sridhar also likely to accompany Harbhajan. The Australians, meanwhile, are likely to be represented by skipper Ricky Ponting accompanied by Andrew Symonds and Brett Lee, among others. As things stood this evening, Harbhajan Singh was unlikely to face any action on the charge of "racist remarks." Apparently, the two umpires Mark Benson and Steve Bucknor have confirmed that they reported the matter on the insistence of Ponting and that they themselves did not hear anything provocative. It would mean one man's word against the other and for want of evidence, Harbhajan is unlikely to cope a fine or punishment. However, it remains to be seen whether anything offensive was recorded by the stump microphone, which will now become an instrument in bringing out the truth. Former Indian skippers Ravi Shastri and Sunil Gavaskar, meanwhile, used strong words against the racial abuse charge against Harbhajan in their reactions on television. Gavaskar believed that Australian skipper Ricky Ponting should have never raked up the issue as Harbhajan's alleged remarks had not been heard by a third person. "It's one man's word against the other and apparently can't be proved," commented Gavaskar, warning that it would open a pandora's box for the Australians. "Teams from around the word could accuse Australia of something similar everytime they step on the to the field so such issues are best left un-pressed," Gavaskar said on television. "Whatever remains on the field must remain on the field is an old Australian saying," said Gavaskar. Shastri opined that the issue "had been blown out of proportions." Indian cricket team manager Chetan Chauhan today described Australia's complaint of racial abuse against Harbhajan Singh as a "mind game" and said the move was aimed at removing the ace spinner from the bowling attack. Chauhan said Harbhajan had not uttered anything "wrong" during his altercation with Andrew Symonds and the Australians were raking up such issues only because they cannot accept India's new found aggression. "Harbhajan has not uttered anything wrong. The Australians are playing mind games. We have got the hearing tomorrow and we will argue our case", Chauhan said. Asked how Harbhajan had reacted to the whole issue, the former Indian opener said "He is okay. Such things happen on the ground. We are prepared for the hearing," he said. On Australian opener Matthew Hayden's assertion that Australia have a strong case, Chauhan said "They will definitely say that. He (Harbhajan) has troubled them the most. They would definitely want him out of the bowling attack", he said. "We also have a strong case. We will back him", Chauhan told CNN-IBN. Peters, who is currently in the city, will advice Procter and the two teams - India and Australia - on procedural matters during the hearing. The ICC has taken the Australian team's allegations against Harbhajan very seriously as it is a level 3 offence. When contacted, an ICC spokesman in Dubai confirmed that Peters had been asked to be a part of the proceedings. The spokesman revealed that the British lawyer had assisted the ICC in some cases in the past and is regarded very highly by the legal fraternity. "We are taking the whole issue very seriously and that is the reason why Nigel Peters has been asked to attend the hearing," the spokesman told PTI. Harbhajan was charged last night under Level 3 of the ICC's Code of Conduct following his run-in with Symonds at the Sydney Cricket Ground. The charge was laid by match umpires Mark Benson and Steve Bucknor after yesterday's play following a complaint from Australia captain Ricky Ponting. The complaint was made by Ponting after the 116th over of India's first innings, prior to which Harbhajan is alleged to have directed a racist comment at Symonds. The alleged offence falls under 3.3 of the ICC Code of Conduct which refers to players or team officials "using language or gestures that offends, insults, humiliates, intimidates, threatens, disparages or vilifies another person on the basis of that person's race, religion, gender, colour, descent, or national or ethic origin". What a day fascinating day of cricket it was. Test match cricket was at its traditional best on Saturday at the Sydney Cricket Ground as the crowd witnessed an absorbing contest between the bat and the ball. They saw the art of spin bowling at its very best; both Anil Kumble and Harbhajan Singh made exceptional use of the roughs created by the bowlers' footmarks. And moreover, there were two Australian blokes - Matthew Hayden and Mike Hussey - who skilfully tackled the spinners to put up a brave show and keep Australia in the hunt. The big question for Ricky Ponting on Sunday would be whether to take the risk of asking India to chase 280 to 300 runs in 75 overs. Even with a wearing wicket, I feel Australia will need five hours to bowl India out. If Ponting is to take such a risk, it would be obvious that he would be trying to seal the series, and more importantly, going for the record-levelling 16th successive Test win. But if the move backfires - and there is a high possibility of that considering the way India batted in the first innings - not only will India break the Aussie winning streak for the second time but it will also give them an immense boost. With series levelled going into the Perth Test, India would be a lot more confident unit. So I wouldn't be surprised if Australia adopts a cautious approach and plays the first session. However, it wouldn't be that easy. Though the Indian bowlers were unlucky on day four, they are at their best and if they strike very early in the day, they could very well bowl Australia out in the first session. 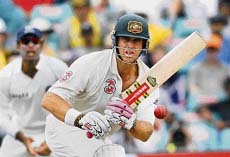 The Indian bowlers were so good on Friday, but were denied breakthroughs by Hussey and especially Hayden. The big man yet again proved his worth by registering his 29th ton. I am sure the ton will be very special for him for three reasons. One, it helped him level Sir Don Bradman's number of centuries. Two, he hung on despite suffering a niggle and having to bat with a runner in the latter half of his innings. And three, it came when it was needed most. Had Hayden fallen after quick dismissals of Phil Jaques and Ponting, with the latter once again unable to read Harbhajan's ' doosra', Australia might well have been bowled out cheaply. On such a wicket, it becomes imperative for a set batsman to score a big one; otherwise the team is put under tremendous pressure. However, his dismissal also came through the same shot in the last session. Getting out in this manner definitely appears silly, especially in Test cricket, but one shouldn't forget that the same shot helped Hayden to unsettle the spinners and garner runs earlier in his innings. South Africa, who were chasing 185 to win, reached 186-3 to level the three-match series 1-1. Smith, who was dropped on 18, faced 79 balls and hit 11 fours in his aggressive innings. Smith and Hashim Amla put on 83 for the second wicket which was ended when Amla (37) pushed forward to a ball from leg-spinner Rawl Lewis and was juggled and caught by Gayle at slip. Gayle pounced again to take the diving slip catch that removed Smith and earned Lewis his second wicket. Earlier, Chris Gayle and Shivnarine Chanderpaul put on 70, West Indies’ biggest 10th-wicket partnership against South Africa, to guide the visitors to a second innings total of 262. Gayle, who batted with a broken thumb and with a runner because of a hamstring strain, was last out for 38. His knock featured four fours and three sixes. Chanderpaul faced 168 balls for his unbeaten 70. Gayle retired hurt on one when he was hit on the thumb by the fourth ball of the day, which was bowled by paceman Andre Nel. Nel struck a different kind of blow when his steepling delivery to Dwayne Bravo (12) took the outside edge and was caught by Smith at first slip. Rawl Lewis (1) played forward to a delivery from left-arm spinner Paul Harris, edging the ball on to his pad and into the hands of Amla at short leg. Jerome Taylor was dismissed just after lunch for 21 when he edged a delivery from fast bowler Dale Steyn to Kallis at second slip. Steyn used the second new ball to have Daren Powell (1) caught by Smith at first slip. The third and deciding Test starts in Durban on Thursday. West Indies (2nd innings): 262 (Chanderpaul 70 not out, Gayle 38; Dale Steyn 4-44). Delhi’s reply began on a disastrous note with India Test discards Akash Chopra and Gautam Gambhir returning to the pavilion after scoring just three and two runs, respectively. Delhi (1st innings): 49 for 3 (Mithun Manhas 26 n.o. ; Sumit Singh 2-25). Vadodara: Bowlers dominated the proceedings as 18 wickets fell on Day One of the Ranji Trophy Elite group semifinal between Saurashtra and Uttar Pradesh here on Saturday. Uttar Pradesh were bowled out for 188 in the first innings and their rivals were tottering at 116 for 8 in reply at close of play. Youzhny, who edged out defending champion Xavier Malisse of Belgium well past midnight in a rain-delayed last-eight match yesterday, hardly played a false stroke on a warm evening to ease into his eighth ATP tour final. Youzhny was delighted to reach the final at the start of 2008 and said Nadal would be tough to overcome. Youzhny, 25, produced a solid game once again against an overawed opponent playing in only his third tour semifinal. Youzhny broke the tall Cilic’s serve in the opening game and constantly brought pressure on his young rival, who struggled with his serve and dished out 29 unforced errors. The Russian clinched a second break of serve in the seventh game before pocketing the opening set. Cilic, who upset French fifth seed Nicolas Mahut in the second round, staved off two break points in the fifth game but was broken in the seventh and ninth games and conceded the match when he sent a return long. Earlier, Youzhny defeated Malisse 6-4, 6-4 to enter the semifinals. The Hi-Fliers, too, won in the tiebreaker, getting past Orissa Steelers 5-4 in the other semifinal at the Sector 42 Hockey Stadium. Earlier, in the nail-biting clash between Dynamos and Sultans, both teams failed to score in the regulation time. The Sultans stunned the almost packed stadium when drag-flicker Diwakar Ram converted a penalty corner in the first silver period (73rd minute). Deepak Thakur rescued the Dynamos with a last-minute goal to level the score at 1-1. Sandeep Singh executed a drag-flick from the half line into the striking circle and Thakur, who positioned himself in front of the goalmouth, deflected the ball into the net. As the second silver period, which saw repeated attacks by the Dynamos, went barren, the game extended to the penalty shootout. Dynamos skipper Rajpal Singh, Deepak Thakur, Ravi Pal Singh and Gaurav Tokhi sounded the board but Prabhjot Singh wasted his chance. Deedar Singh and Pramod Kumar scored for the Sultans, but captain Sardara Singh and Bikas Toppo failed to deliver. In the second semifinal, 2006 PHL winners Hi-Fliers outstroked defending champions Steelers. The Steelers netted two goals in the first quarter through Sunil Ekka. The first came off penalty corner (fourth minute). In the 16th minute, after collecting a pass just outside the ‘D’ on the right side, Ekka darted into the circle and dodged three defenders before executing a reverse hit to double the margin. Hi-Fliers’ drag-flicker Len Aiyappa converted two penalty corners (23rd and 62nd minutes) to restore parity. The teams remained level at 2-2 at the end of regulation time as well as extra-time. In the shootout, the Bangalore side won 3-2 to enter the best-of-three finals. Tushar Khandekar and Sebastian failed to net the ball for the Hi-Fliers, while Prabodh Tirkey and Roshan Minz struck for the Steelers. However, Damandeep Singh, Kim Chul and William Xalco let down the Orissa team, while Arjuna Halappa, Vikram Kanth and Sandeep Michael were on target. Hi-Fliers goalkeeper Bharat Chetri was declared the Man of the Match. The first final would be played on January 7 at 6 pm. She walked in draped in a rust-coloured dupatta over a dark green silk salwar-kameez, a typical Punjabi bride in a gold-coloured jutti. Accompanying the petite Kudrat was with her celebrity husband Jeev Milkha Singh in his typical formal sports wear. They made a fine couple as they walked down the pathway to the waiting mediapersons who had gathered at the Chandigarh Golf Range this afternoon to meet the newly-weds after their “secret” wedding in the district courts yesterday. Also at hand was Jeev’s mother Nirmal Milkha Singh and two of his sisters. The celebrity father, Milkha Singh, was on the greens of the Chandigarh Golf Club having a golfing stint with his son-in-law. It was a sudden and quiet wedding, said Jeev. It was a virtual bonding of a relationship which started 20 years ago when the two, then in their teens, were neighbours in Sector 7 of the city. Jeev had fallen for the youngest daughter of the then DGP of Haryana Police, Surinder Singh Brar. The teenagers had a liking towards each other, but Jeev’s love for golf saw him being on the move most of the time. The two came together almost 15 years later. Jeev fell again for his childhood flame. He waited for her. And with parental pressure mounting on him to get married, now that he was 36, the fairytale romance was bonded in wedlock. The marriage was kept a quiet affair with the families of the two being the only witnesses. According to Jeev, the big bash has been reserved for a later date, probably March, so that his eldest sister, Alisha, can make it from the USA. The bash will be a big affair with the world’s golfing greats, including Adam Scott, descending on the city. The best vacation for the newly-weds will be in the City Beautiful. We both love this place, said Jeev. He will fly off to Abu Dhabi for the three desert tournaments around January 14 after their first Lohri. His lady luck, Kudrat, who was with him when he won the back-to-back Japanese titles in 2006, will be with him at least during the Desert Classic. “She is the best thing that has happened to me,” said Jeev.